Timothy Thatcher has been EVOLVE Champion since July 10th, 2015, and that reign will continue for at least one more day after another successful defense on Friday night. Thatcher submitted Fred Yehi to retain his title at EVOLVE 78. It wasn't the best defense of his underwhelming reign, though it was likely in the upper half. The match was actually the main event, which is far from a guarantee for Thatcher defenses, and Yehi came off well in one of the biggest spots of his career thus far even though he lost the match. He had the Koji clutch locked on at one point, which was presented well as a false finish even if it was hard to buy that the title would change hands here, but Thatcher was able to stretch out enough to get a rope break. He threw Yehi over and got the quick submission shortly after. Whether Thatcher will hold the EVOLVE Championship heading into WrestleMania weekend will be determined tomorrow night as he puts his title on the line against Zack Sabre Jr. And though his opponent got a huge victory over Chris Hero in Hero's last EVOLVE appearance, Sabre came up short in his match on Friday. Keith Lee picked up a surprising win over Sabre as their styles meshed better than would be anticipated. Lee used his power to get the best of ZSJ, though there were plenty of points where Sabre had the upper hand as well. He bridged up on Lee to the delight of the crowd early in the match to set the tone and fought back as it went along, but he was eventually put away with a gigantic powerslam after Lee countered his submission attempts. The decision to have Lee go over probably shouldn't have been as surprising as it was. He was a significant addition to the EVOLVE roster and likely needed a big win after dropping his debut against Hero. Whether Sabre wins the title from Thatcher or not, Lee is someone that should be one of the top contenders to take the championship soon. And ZSJ losing here and setting up a potential challenger may make it even more likely that he takes the title from Thatcher. It was a mixed night for Catch Point in addition to Yehi's loss in the main event of a show that was advertised as consisting of all fresh matchups. "Hot Sauce" Tracy Williams was defeated by ACH earlier in the night in one of the better matches on the show. ACH came alive at the end of the match to hit a sequence of big lariats before getting the pin with a brainbuster. He was hyped up as another challenger for Thatcher's championship, and he'll be due a title shot if he gets past Jason Kincaid at EVOLVE 79. Matt Riddle and Chris Dickinson & Jaka were able to redeem the night for Catch Point. Riddle opened the show with a win against Anthony Henry by connecting with a fisherman buster, a jumping tombstone, and finally locking on the Bromission. It was a solid match despite its few timing issues, and Riddle got on the mic after to state his desire to capture the EVOLVE, FIP, and WWN titles, as well as to call out Drew Galloway. He didn't get what he wanted then, but he didn't have to wait too long to clash with Galloway. Galloway got on the mic to respond to Riddle following his match with Jeff Cobb. Both men were impressive, with Cobb able to throw Galloway around despite his opponent towering over him. Galloway worked over Cobb's arm in an attempt to keep him from hitting the Tour of the Islands, and was later able to connect with a Future Shock DDT to get the pin. After that was over, Riddle came out to the ring as Galloway said that they didn't have to wait for their grudge match tomorrow. That led to Galloway pushing Riddle into Cobb, who took offense to it and laid out Riddle with the Tour of the Islands. Catch Point backed up Riddle as Jaka wanted to go at it with Cobb, but he was called off by his partners. Jaka & Dickinson continued their unbeaten run as a tag team in EVOLVE with a victory over The Gatekeepers by utilizing their Doomsday Device double chokeslam. It was made clear that they would soon challenge for Williams & Yehi's tag titles, including Larry Dallas again trying to create dysfunction within Catch Point as he interviewed the group. Also on the show, Ethan Page went over Kincaid by hitting the RKEgo in what was billed as something of a prelude to him facing a similar rival in Darby Allin tomorrow. Allin wasn't as successful, however, as he lost to Austin Theory. Theory whiffed on an Asai moonsault to the outside at one point and crashed into the barricade hard. Allin's FIP stablemate Priscilla Kelly was also at ringside. While an enjoyable time, this will hopefully be in the bottom half of EVOLVE shows this year. There were some good matches, but nothing stood out as being something that must be watched. With EVOLVE running monthly double-shots, the first show of the weekend often feels like it's mostly setting up what's to come the next night. EVOLVE 79 looks to be a more interesting show on paper. Thatcher will defend the title against Sabre, Riddle and Galloway will finally face off, and the undercard looks pretty promising. Keith Lee defeated Zack Sabre Jr. 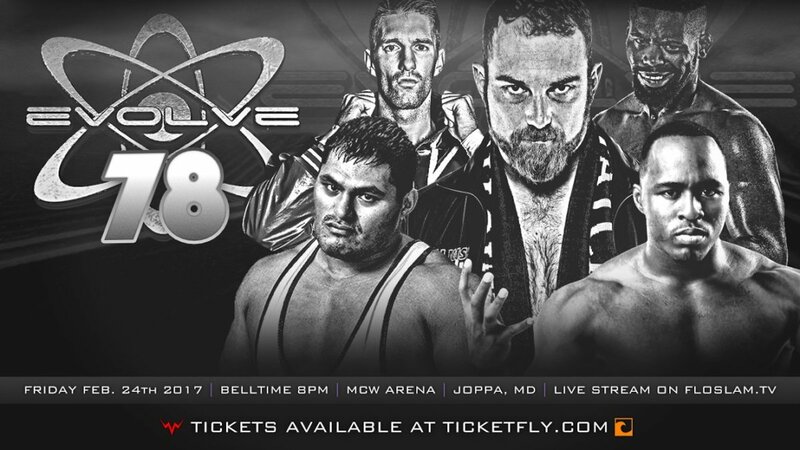 EVOLVE 79 recap: Timothy Thatcher vs. Zack Sabre Jr.